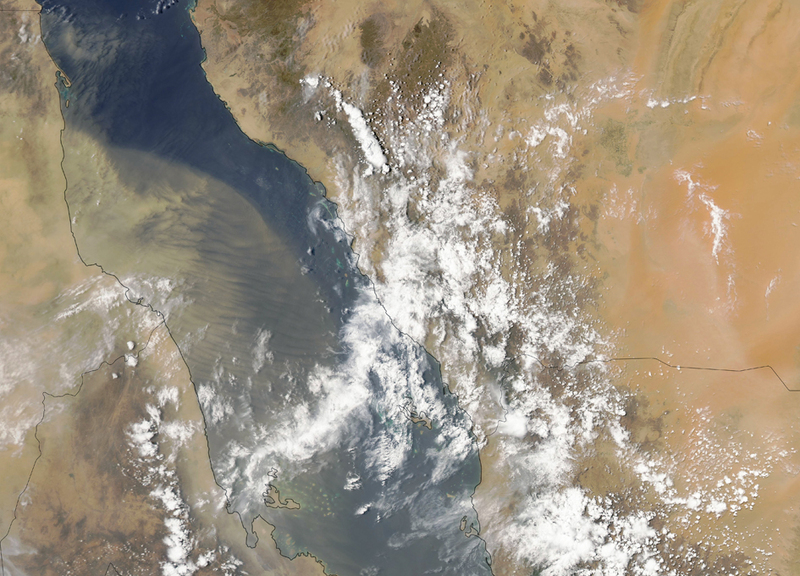 In June 2018, winds lofted dust from the Sahara Desert and carried it over the Red Sea. On June 14, the dust storm had been blowing for about a week. But on June 11, the dust had a peculiar appearance. The Moderate Resolution Imaging Spectroradiometer (MODIS) on NASA's Aqua satellite acquired this natural-color image of a wave pattern in the dust. Leigh Munchak, a meteorologist at Weather Analytics (previously at NASA's Goddard Space Flight Center), noticed the dusty waves in the June 11 satellite image and pointed them out on Twitter. She thinks the pattern is likely due to gravity waves in the atmosphere, caused by wind shear. "In this case, hot, dusty desert air is slowed down by the ocean surface," she said. "The top of the air layer is moving faster than the cooler, denser bottom layer air, which causes waves to form similar to how the wind causes waves to form on the ocean." Bastiaan Van Diedenhoven, a researcher for Columbia University and NASA's Goddard Institute for Space Studies, agrees that gravity waves are likely causing the pattern. "The same waves create waves in clouds, or undular bores, where clouds form where air rises and no clouds form in the 'valleys,'" said Van Diedenhoven. "Here the waves are sorting dust into bands. Gravity waves often occur in the atmosphere, but you need clouds, or in this case, dust, to make them visible." Dust storms over the Red Sea are not unusual. Nor are waves in dust; notice the patterns in this thick plume that blew over the sea in June 2016.